The calendar New Year starts January first, but the astrological New Year takes place on March 21, when the Sun goes into the sign of Aries at the spring equinox. What ever date you observe, New Year’s Day is symbolic for new beginnings and new life, hope, and the return of positive emotions. It is easy to be happy at the spring equinox on March 21, when we celebrate the warm days of spring and summer yet to come. Who wouldn't want to party after being cooped up for the winter season! ​The fact is, astrology’s main purpose is to help man to chart his way out of any external influences- to become a free soul, guided only by the light of truth in his own heart. Your birthday is a guide to the ways that you can be generous, sunny, proud and confident. It is a blueprint of your soul's wishes for experience in this lifetime. It reveals your strengths and weaknesses, all gifts of a loving God/Sun/Divine Energy. My focus in this article is the sign of Aries. Aries are the gift of the Sun, no doubt! An Aries person is inspired by the Sun and spring air to be a positive person. They are about doing and being. They are like the life of the new born rabbit, or the freshening breezes of spring when things get a little softer, but you can feel the cold of the snow melt in the mountains. 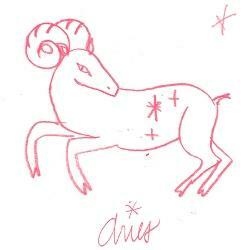 An Aries person is an example of the leader of the zodiac, and this sign's emphasis on the head is no coincidence. Aries have prominent foreheads, and they get knocked around by life. They have joy in being alive! This is because of their choices in activities. Aries people like to be soldiers, adventurers and pioneers. Aries women are equally adventurous with the men to grasp new experiences and face down fear. The trouble is that fear often comes in the form of an aggressive authority figure, which these sons and daughters of spring must resist. It is their resistance to other’s leadership which gives them the reputation of making a good target. They engage the enemy and sometimes they get hurt. Pain is the Aries person’s familiar friend and guide. They take chances in life routinely for the sake of experience, and they celebrate direct learning and active participation in everything they do. Aries never give up sports, even when they mature into coaches and seasoned spectators. Aries need multiple experiences before they learn not to hurt themselves and this applies to physical, mental and emotional hurts. If you love an Aries you will need to pay attention to the vulnerable emotions of your sweetie. Aries have a strong need to lead, but they actually need to serve just as much. The Aries is a born romantic although he can be somewhat self-centered. He or she likes to control and call the shots in all things, especially love. If you are dealing with an emotional person like this you must not show too much submission. You need to be able to handle rage and not get scared of it. Rage is how “Martians” blow off steam. It is not really directed toward you. The mother in the TV show Malcolm In the Middle is an exaggerated picture of the Aries sign. Her rage and disciplinary frenzy is a picture of her reaction to the frustrations of life. Aries look for logical action and clear communication from those around them even when they are irrational. I recommend that Aries have healings every 3 months, and take a retreat every other year when Mars, their ruling planet, goes retrograde for a couple of months. This is an ideal time for a vacation or a time out from routine. Usually a Mars retrograde period is a restful time for Aries and those around them.